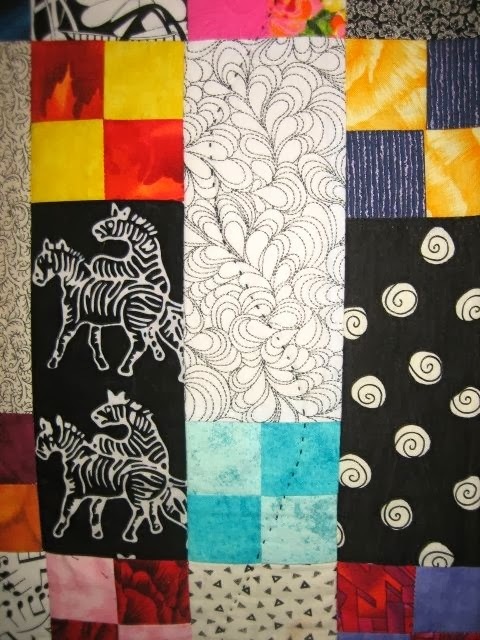 SAQA - Studio Art Quilts Association has a traveling trunk show that will start at the SAQA conference in Washington DC this april and continue across the United States and around the world. It travels for 3 years. 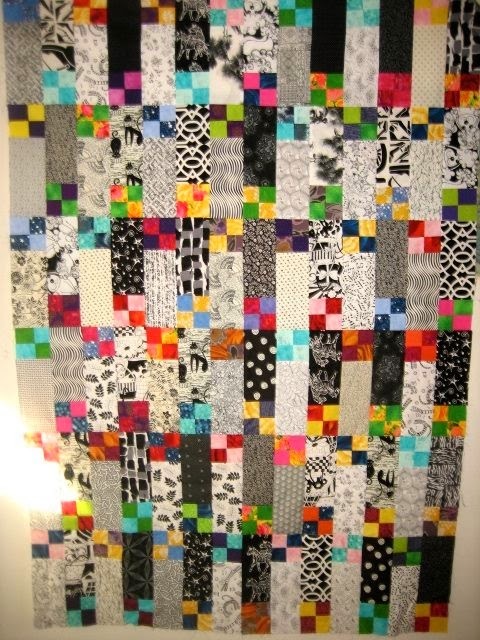 A group of quilts from this exhibition will be chosen by jurors Linda Colsh and Margaret Keeney to become a permanent part of the collection of the National Quilt Museum in Paducah, Kentucky. The piece I created for the trunk show is based on another small piece I recently finished. 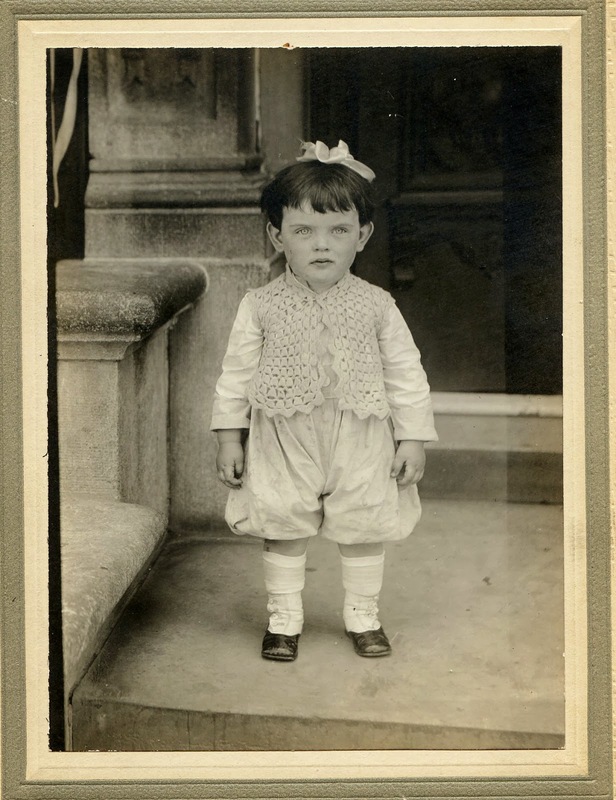 I have this old photo of my mother in law - it is over 90 years old. I love the picture, the outfit and especially the high button shoes. She was a very pretty woman and such a sweet little toddler, I knew I had to do something with it. I scanned it and put it in Photoshop Elements and using the "filter" option across the top, I went to "stylize" and then "find edges" - an instant line drawing. I did remove some of the "noise" using white out. 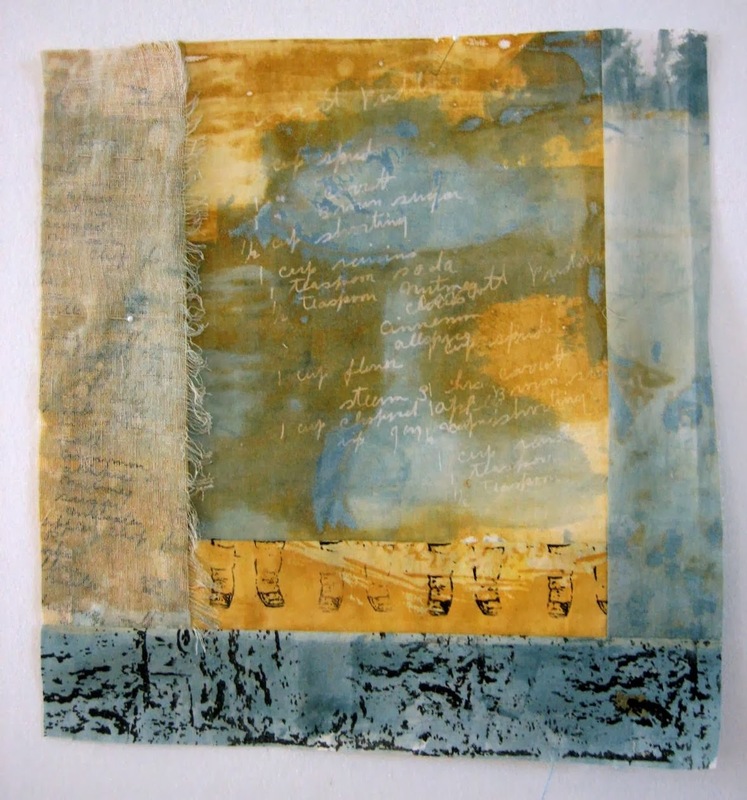 I also wanted to use my screens of writing from my grandmother - some were screened with textile paint and some with discharge paste. 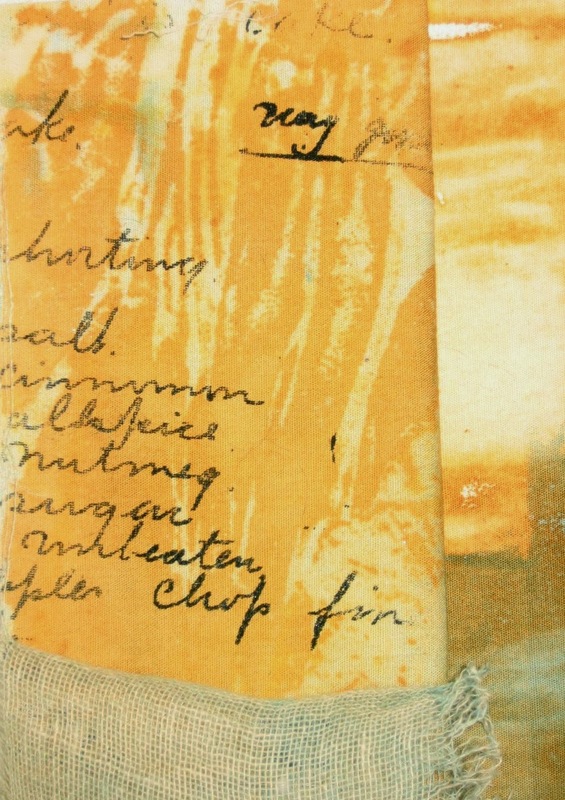 The textile painted words were made more subtle by the use of gauze as an overlay (left side) and the discharged words were used in the middle as a backdrop. 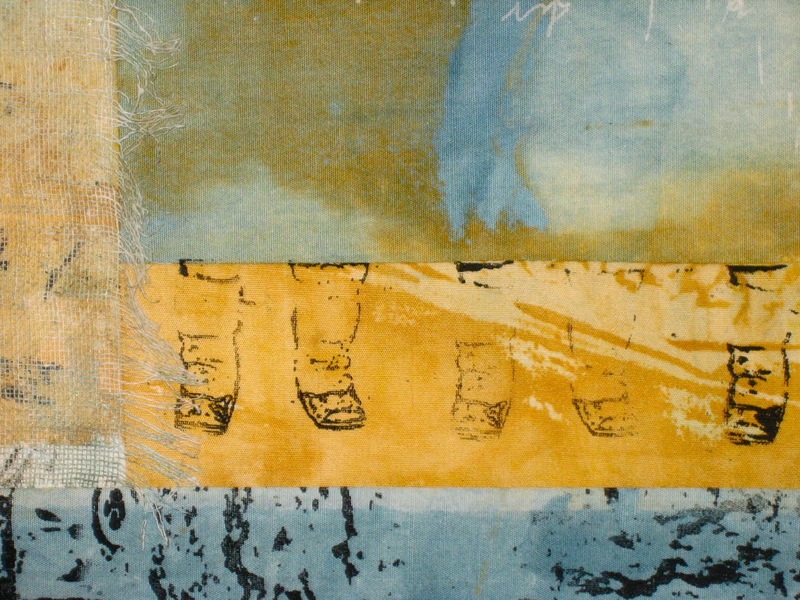 All the fabrics were deconstructive screen printed fabrics. and then screened "Hilda" in the center of the piece. 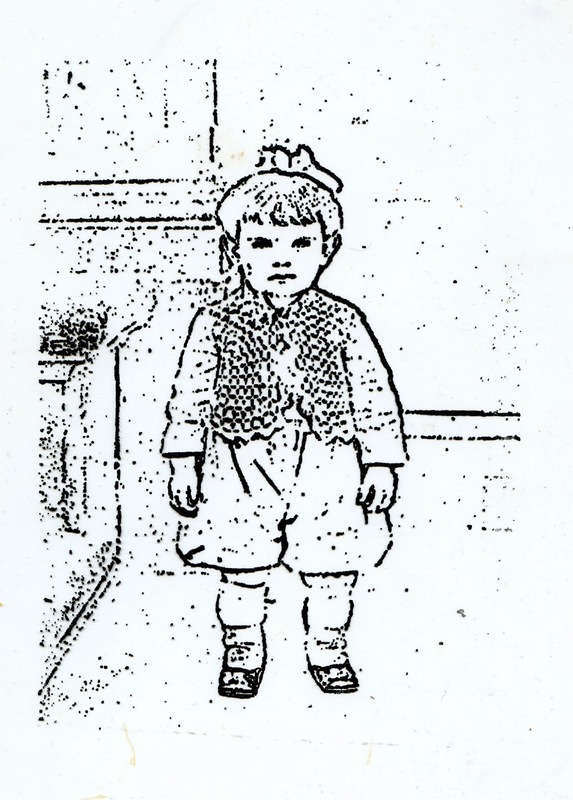 This is the original and it's called "High Button Shoes". It's only a 12" square piece but still too big for the SAQA show. The ones for SAQA were to be 7" x 10" in a portrait orientation. 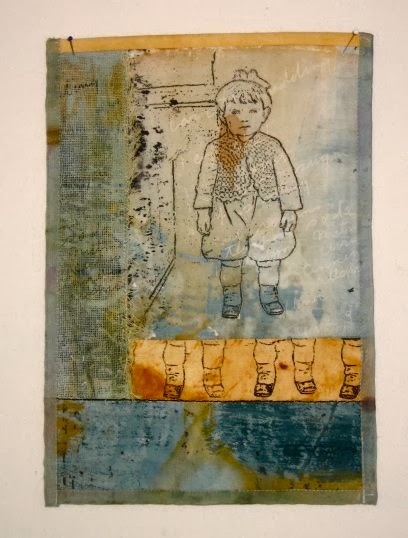 Here is the one I did for the SAQA show which is 7" x 10" and named "High Button Shoes II". I did bind this one unlike the original which has a facing. To keep the binding soft and subtle, I use silk organza - it gives a nice edge. I am still on a roll to finish UFOs before diving into some new things. 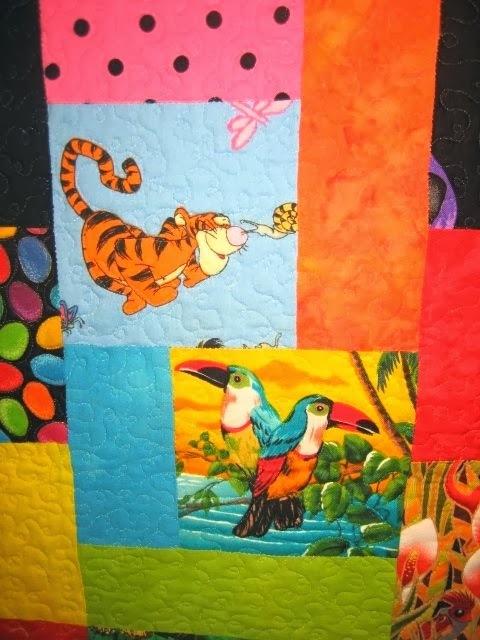 This quilt was a "must do". I made it for a grandchild I hoped to have one day. This was years ago at our PTA retreat. I wasn't sure if I would ever get to use it, but I now have a granddaughter who is 18 months old and so ready for it. 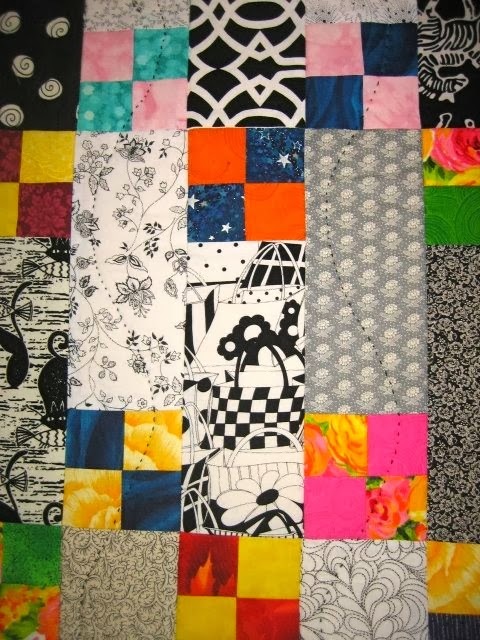 This is such a fun quilt to do and a good way to use up scraps. I've done a number of them but always in a children's theme. I used different polka dot fabrics to bind the edges. 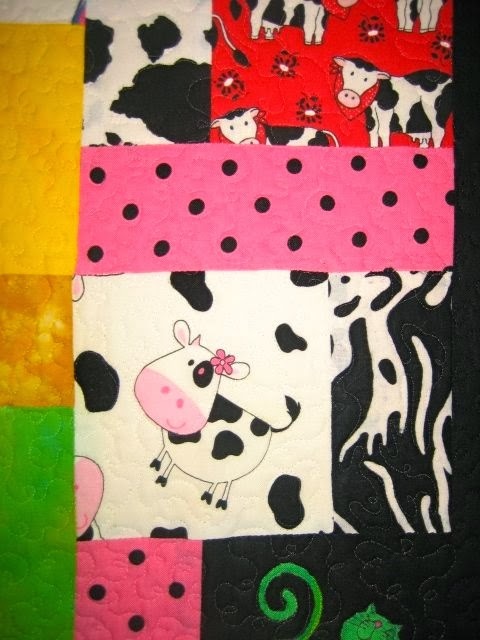 I also used lots of animal and bug prints which I know Audrey will love. She's in love with tigers so "tigger" will be a big hit. 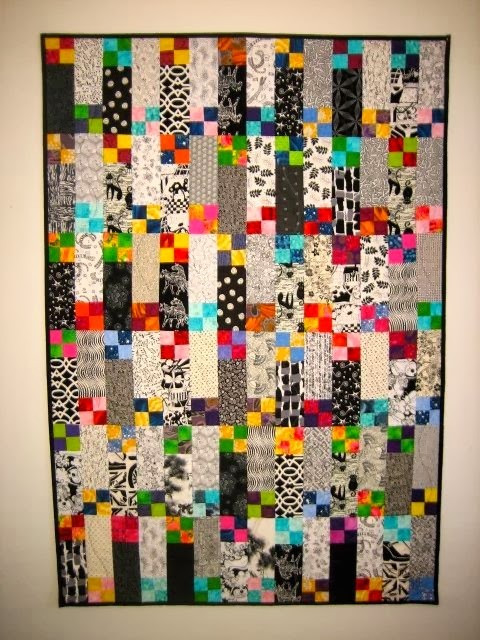 There is a tutorial for making this quilt on my blog, a fun winter project. I finished my scrappy quilt the other day and it was a good feeling to cross it off my list as well as being happy with the results. 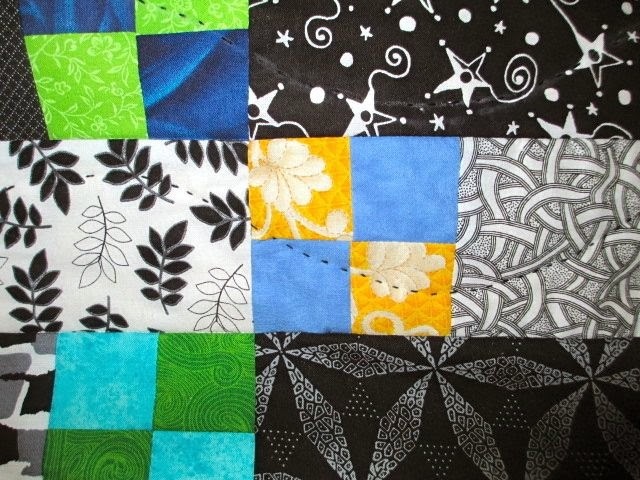 As I've mentioned so many times, I'm not a good piecer so something like this is more of a challenge to me. 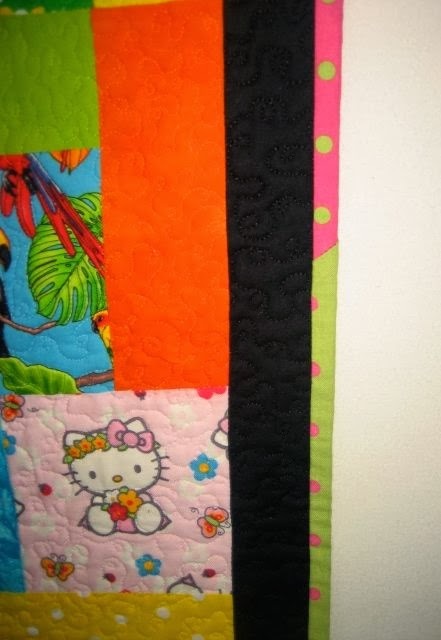 On close look, you'll see seams that don't line up but the overall effect is bright and happy and that pleases me. Some of you had asked about the overall dimensions, amount of blocks etc so you might do it with your fiber group. I will say it's a lot more fun to do with others as everyone can contribute to the pile of fabrics giving you more of a variety. There were 4 of us from our PTA retreat last year who made this quilt. We did all the cutting at home and brought them to retreat ready to go. 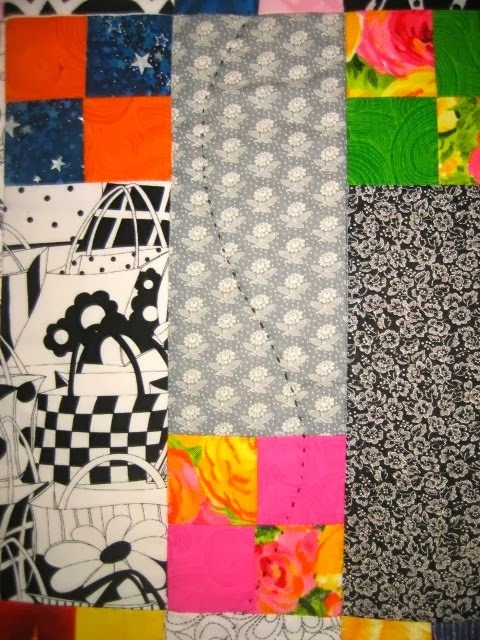 We set up our machines in a quandrangle and arranged the cut fabric in piles - in the middle. The small squares were stacked according to color and the longer strips divided into blacks and whites. The finished quilt is 60" high and 42" wide finished. 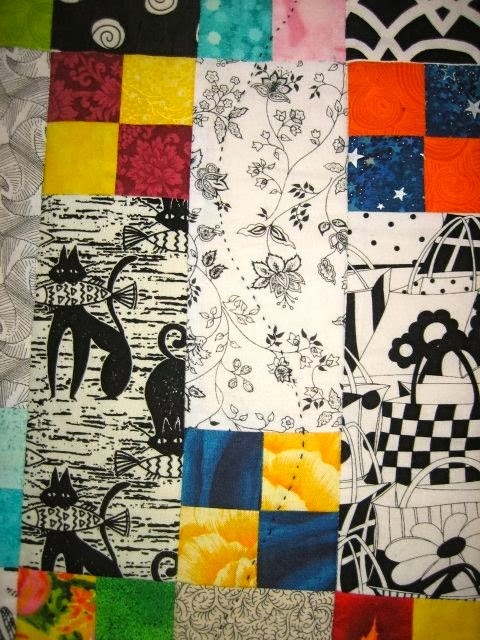 Each unit is made up of one long strip (black or white) and one small 4 patch. There are 14 units across the top and 6 units going down for a total of 84 units. 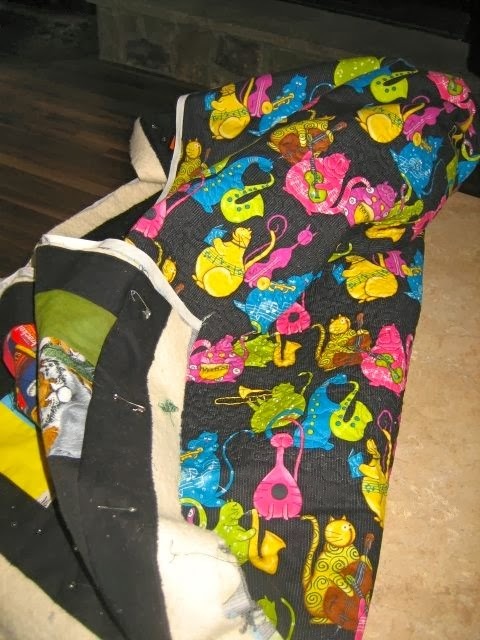 All meansurements given include the 1/4" seam allowance. 42 black with white print strips - 7 1/2" x 3 1/2"
42 white with black print strips - 7 1/2" x 3 1/2"
We cut a lot more than was needed to give us lots of choices - what was left over will get used probably by our "resident piecer" - Kate who is faster than the other 3 of us put together. 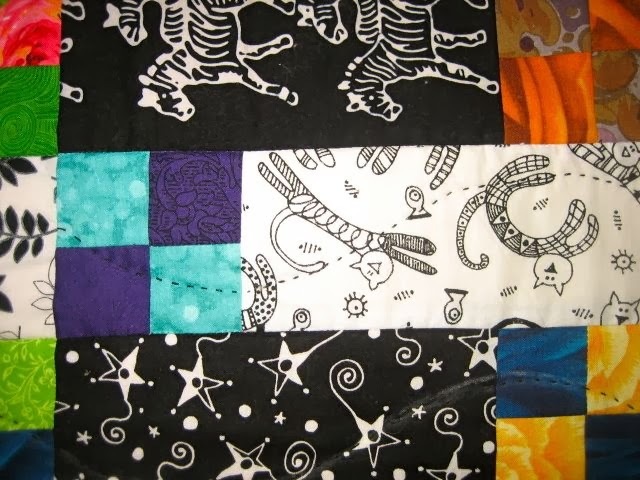 We did lots of little 4 patches and than randomly attached them to a longer strip - not too much thought - just grabbed and sewed. We stitched the units going across and as you can see in the top picture the 1st unit has the 4 patch on the top; the next unit, the 4 patch was on the bottom, staggering them all the way across. We staggered each row like this. We attached the 1st row to row 2, then 3 and 4 together and then 5 and 6. Last we attached 1 & 2 to 3 & 4 and then to 5 & 6. This made it easier to handle. 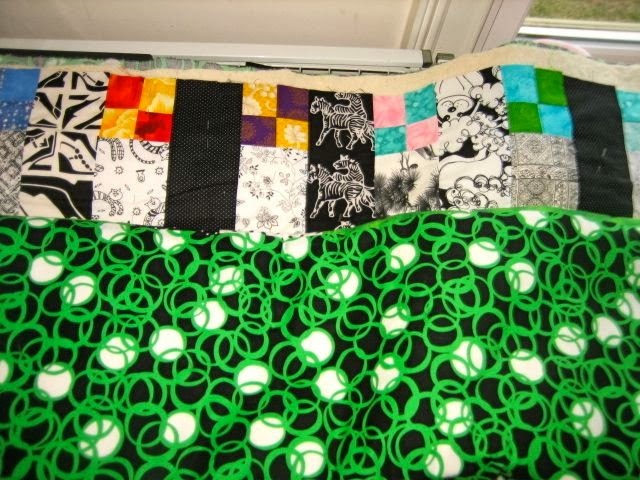 The quilt is so busy, it doesn't need elaborate quilting so I quilted in the ditch. I then decided to go back and add some wavy rows of hand stitching using 2 strands of black embroidery floss. I like doing this kind of stitching and thought it added a little extra something. 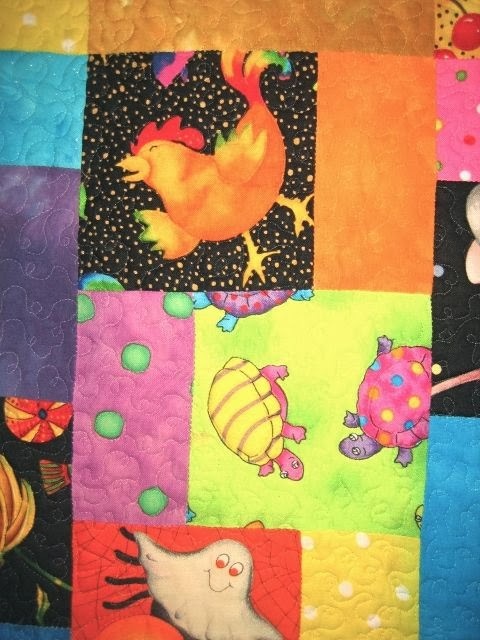 Our 2014 retreat is coming up soon and we're busy looking for some fun and easy quilts we might like to do, Can't wait! Fiber Junkies had their first meeting of the new year this past tuesday. 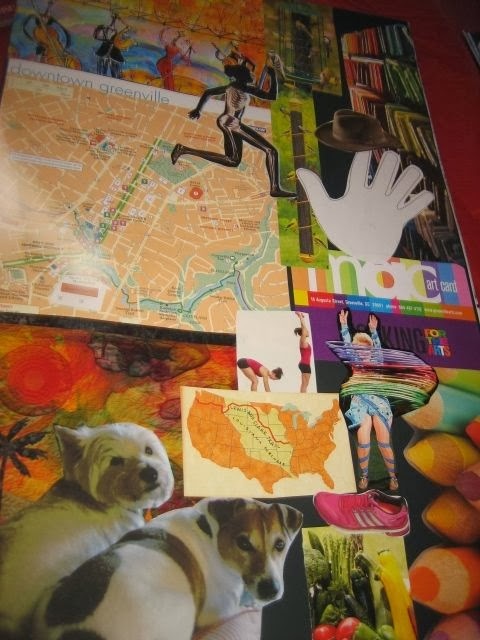 Denny came up with the idea of making a collage of goals, things we like, things we might want to try. She had done this before and loved the idea of revisiting it at the end of the year to see how much she had accomplished. A nice idea. I used to belong to a fiber group that sat in a circle, first meeting of the year and went around each one stating goals, things they wanted to do. It was fun to share and see what others had at the top of their fiber bucket list. 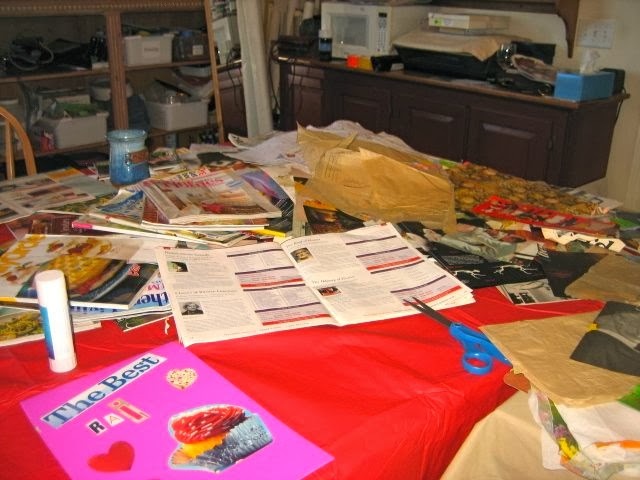 We met at my studio as I have some large tables we were able to spread out on, make a mess and really get into it. 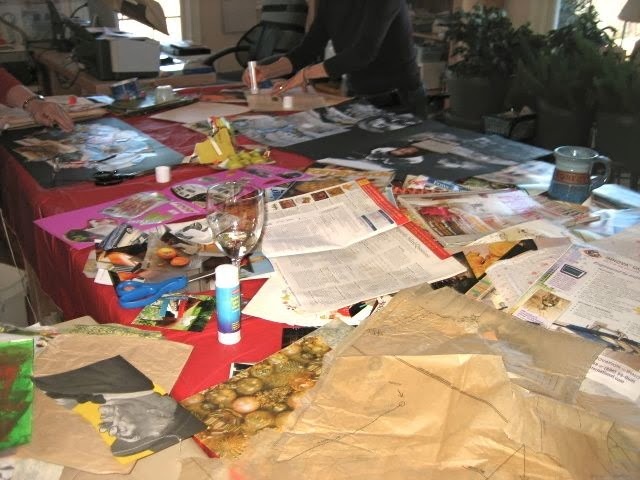 Oops....is that a glass of wine I see next to the glue stick, we do have fun while creating. I think we all had a different idea on how this project was to be done. 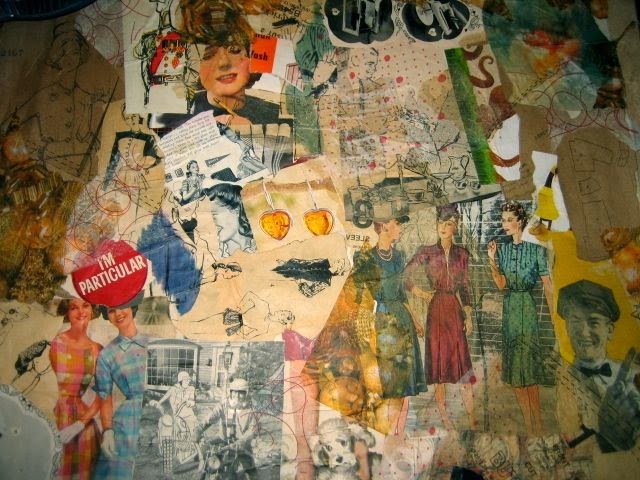 I stuck with vintage images as I had old magazines from the 50s. 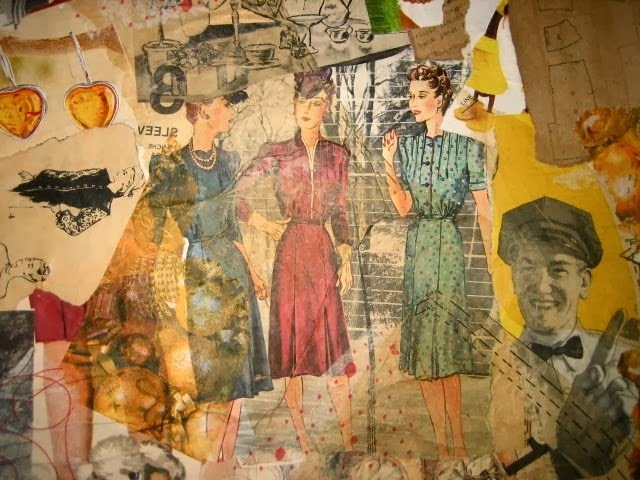 I especially loved the clothing and I love working with vintage materials. I think if I were to do this again, I would have a different approach in being more specific to some goals. It was great fun though and everyone's had such a different personality. 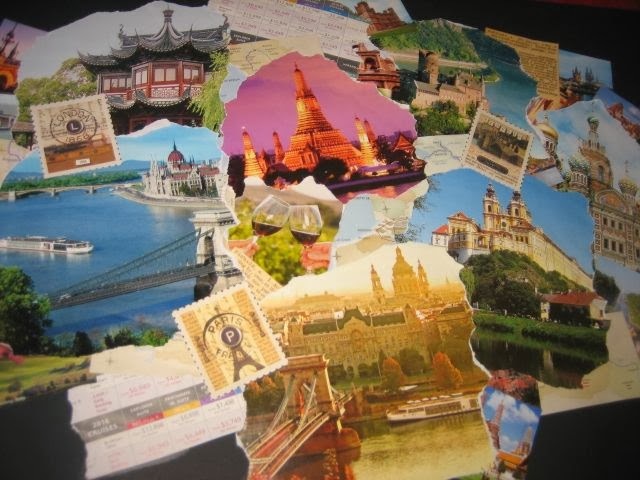 Gen used pictures of places she would love to see...I'm with her! Her piece was fun to see - very colorful. Mary worked on a collage/card for her grandson who loves cars. He will love it! 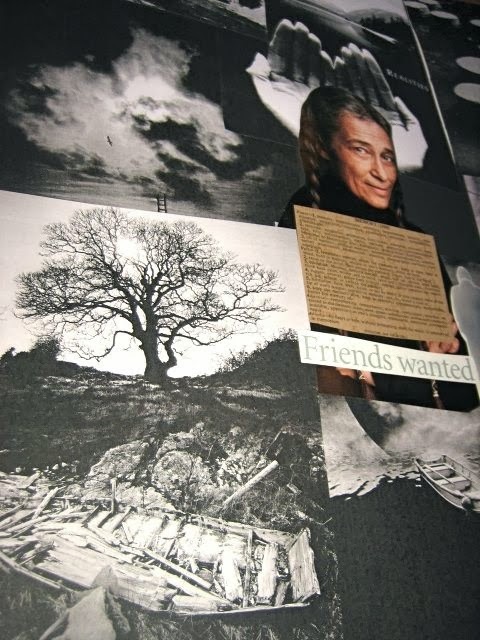 Denny did a collage with an outside and inside. The poster board was folded down the middle allowing you to close it. This is the outside and features the kind of things you wear "on your sleeve". She loves dogs, wants to exercise more, eat better and the map of Greenville where she lives. We also had time to have a demo making a Thermofax which takes a very short time to make. During show and tell, Kate showed us this beautiful plate she had purchased on a recent trip. 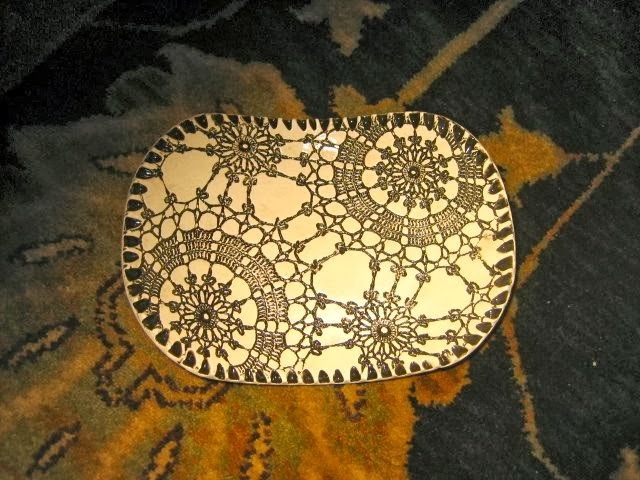 It was pottery imprinted with a piece of lace. I'm looking into this as I would love to have a plate made using some of the lace from my daughter's wedding gown which I made several years back. 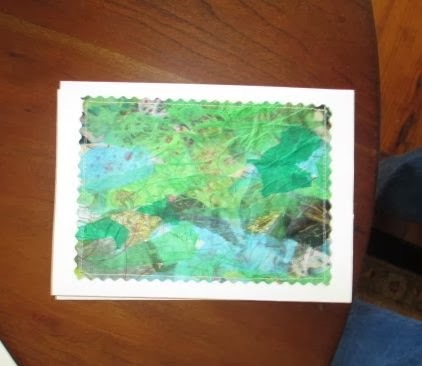 Kate also showed us some cards she's been making using the paper/cloth. 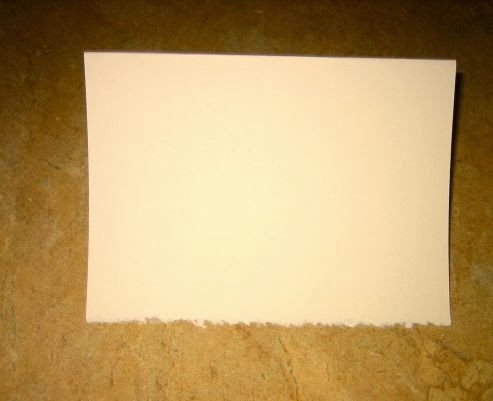 She uses the blanks and picks an interesting area on her large piece of paper cloth to mount on the front of the card. She uses a scalloping scissor to make a nice edge. How clever! And I found some card blanks in my closet that would work....What a great idea Kate! As always it was a wonderful and inspirational day. I'm so lucky to be part of this group. Once again, we gathered at the home of Barbara S for our PTA meeting, always such a fun and inspirational group. After lots of talk, lunch and yummy dessert made by Barbara, we headed into the living room for our Show and Tell - looks like lots going on over the holidays besides eating and opening presents. Gen showed us a tree skirt she had made. 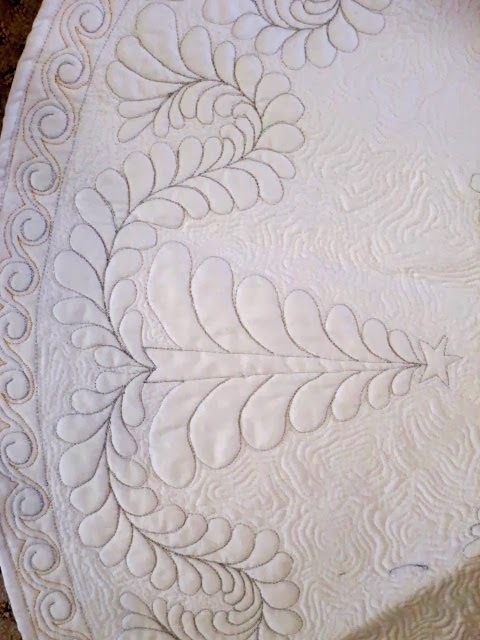 This is a close-up which really does the beautiful machine quilting justice. 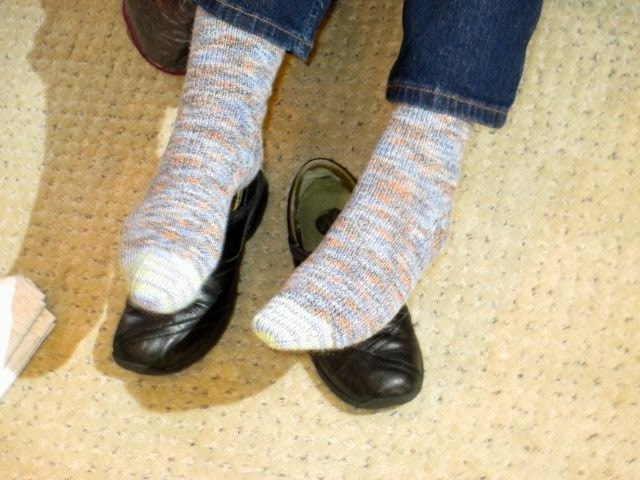 And Gen, being our resident Master knitter showed us her latest project. 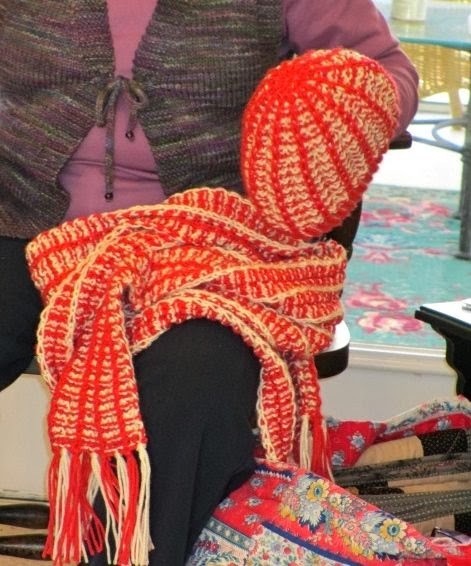 This woman can knit anything...really!! She's also wearing a vest she made a while ago. 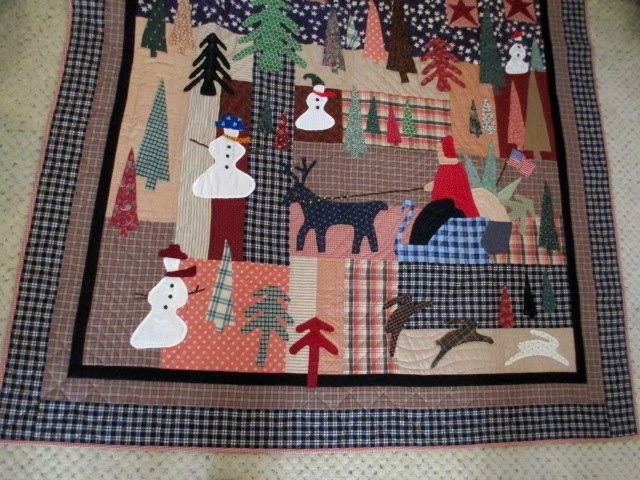 I love this Christmas quilt Gen made a while ago but brought to share. The full picture was not as good as the 2 close-ups. One of our members - Leigh Ann, lives in Florida and comes back for our retreats. She is with us in Asheville for a while and we are so happy to have her. 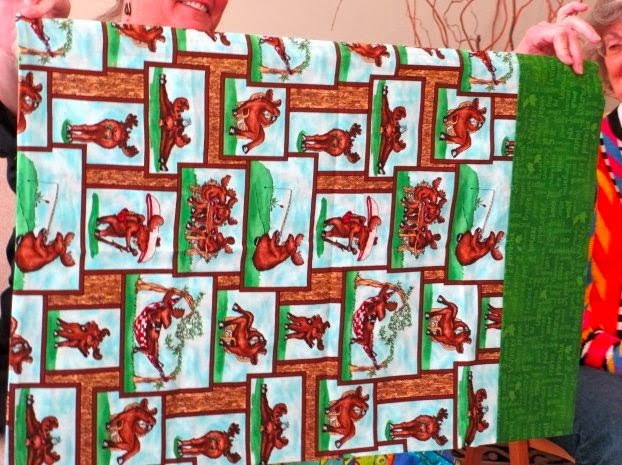 She has committed to make 100 children's pillowcases for a project her company is involved with. They all will feature the same green color on the edge which is her company's color. Linda, who never knit anything...ever... is going great guns. She's done a number of pairs of socks and now onto a vest. I wanna...wanna learn to knit! 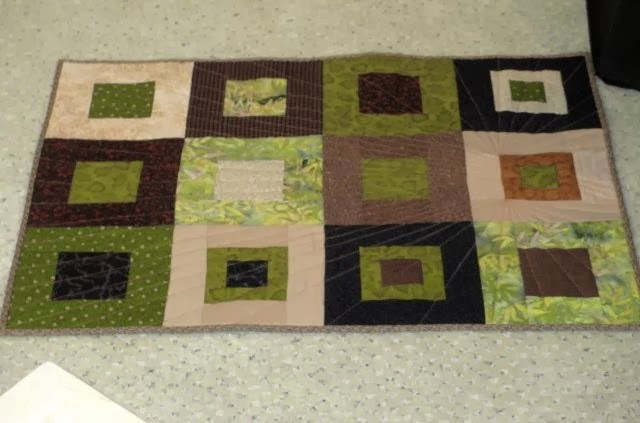 Mary finished her "leftover blocks from another quilt" quilt which looks great with the radiant quilting lines used as a design element. Mary is now working up samples for upcoming workshops she has. 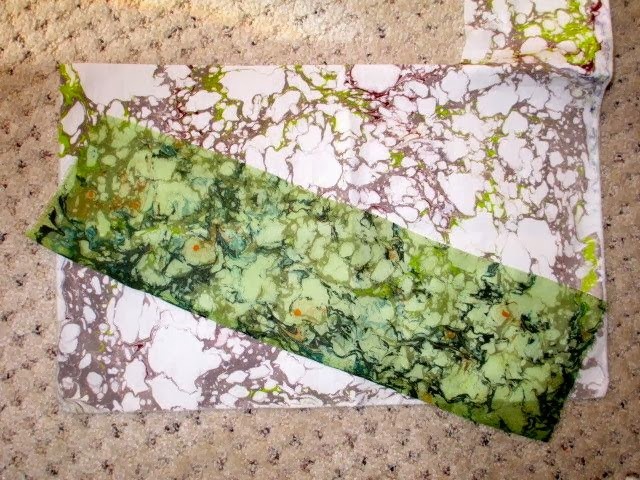 She started with sheer fabric placed over other fabric both of which she marbled herself. 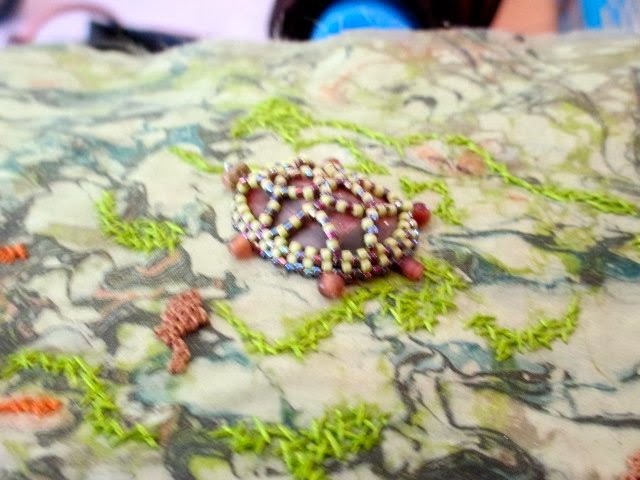 Her Cabachon stone is disguised as a turtle and absolutely wonderful to see up close. And a new technique from Mary....ruffled beading, how clever! Georgia attended the Bernina reunion for Bernina artisans held in Chicago. Mary and I were also invited to go but couldn't make it. I heard it was wonderful and attendees learned the most amazing things that the new Bernina will do including painting on fabric - yes you read correctly. This beautiful eye glass case was one of the projects along with the pillow below, all utilizing new features on the Bernina. 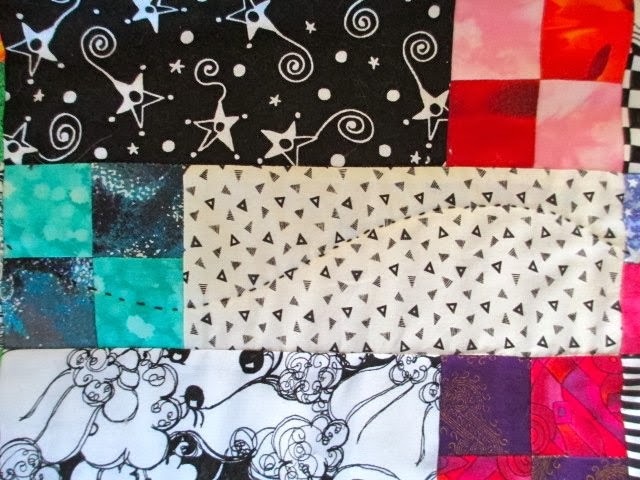 I've been trying to finish up quilt tops so I can move onto other things. 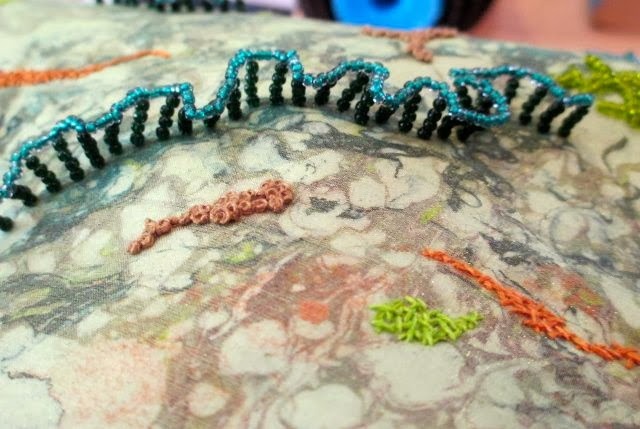 This is one of my pieces from our annual retreat, made at last year's retreat. 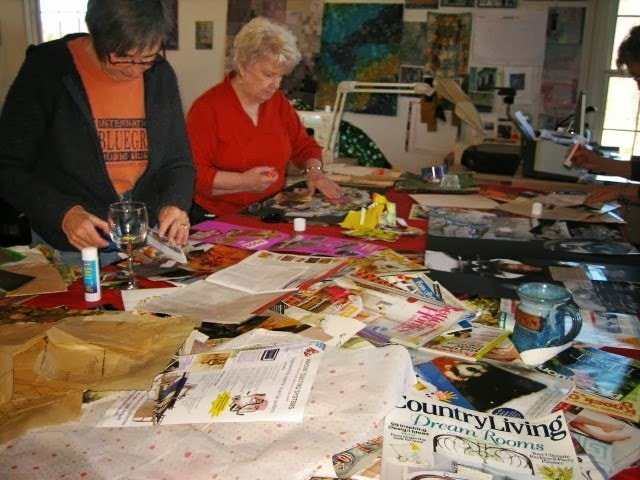 A few of us always work together, swapping and sharing fabric, deciding on a theme and making sure it's a no-brainer so we can talk and be part of the group conversation. This was our choice for last year and it was a fun piece to do. Now to quilt it. 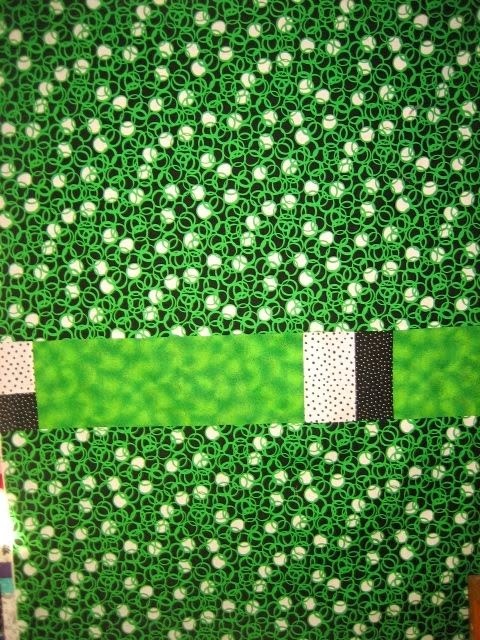 I needed a backing and found this fabric I picked up on sale and stashed away for future use. 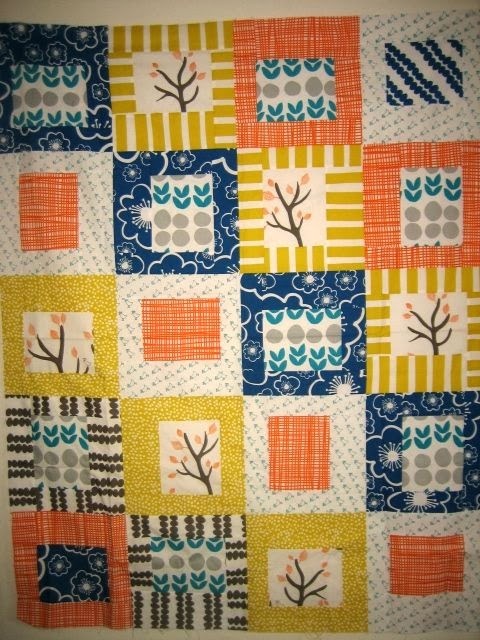 I think it works well with the quilt top. I didn't have quite enough so I had to add another green. I barely had enough of the other green which led me to adding some black and white also. 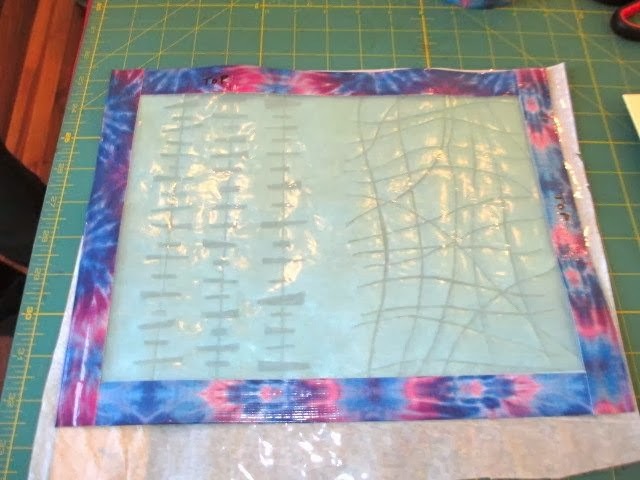 I quilted in the ditch - easy and fast. But then decided it needed some more so I went back with embroidery floss and did some large stitching down the middle of every other row. 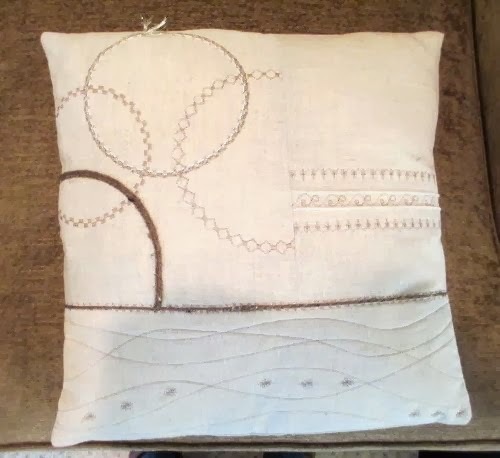 I really like the effect - adding hours onto the completion of it but I enjoy the hand stitching part. I'm about to run out of black embroidery thread and am not going out today to buy more. It's 3 degrees outside...brrrrr. Wish I had some pictures to post of my wonderful down time the week between New Years and Christmas...this is always a fun time for me. It's my birthday week and I give myself that week to do nothing but fun stuff -like working in my studio. 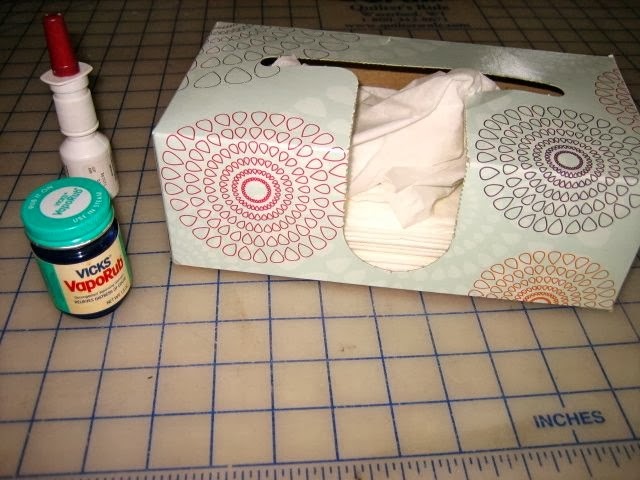 Well, there's a box of tissues, some Vicks and nasal spray. I did have great plans to go like great guns and keep that machine humming the whole time. This is a top I did for my daughter. 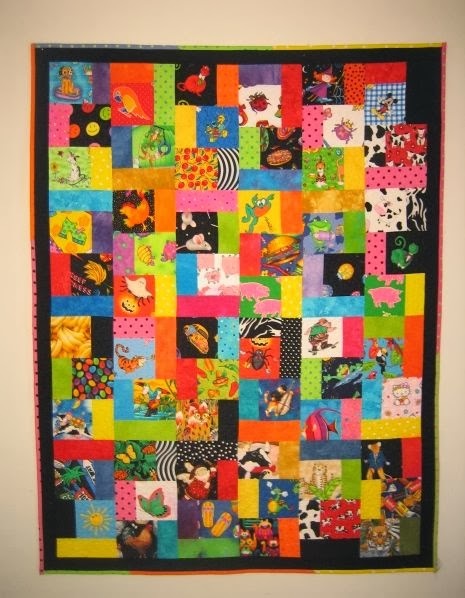 She saw this in a quilt shop - made from a quilt kit and bought it. It was a bit confusing so I offered to put it together for he, it's a really cute, vintage looking piece. I planned on quilting it this week. 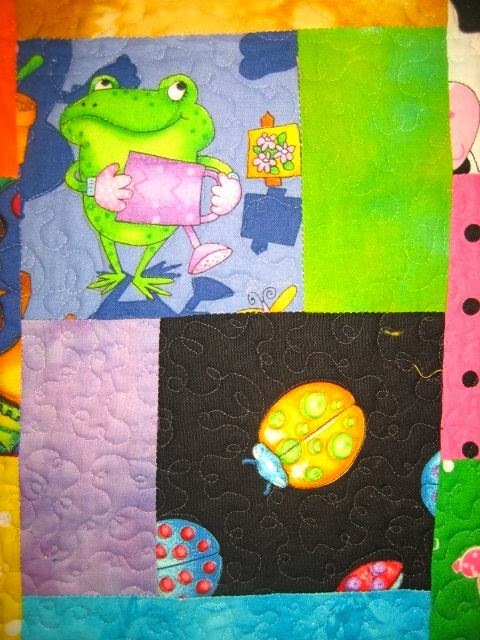 And this one from last years PTA retreat - finally ready to be quilted. 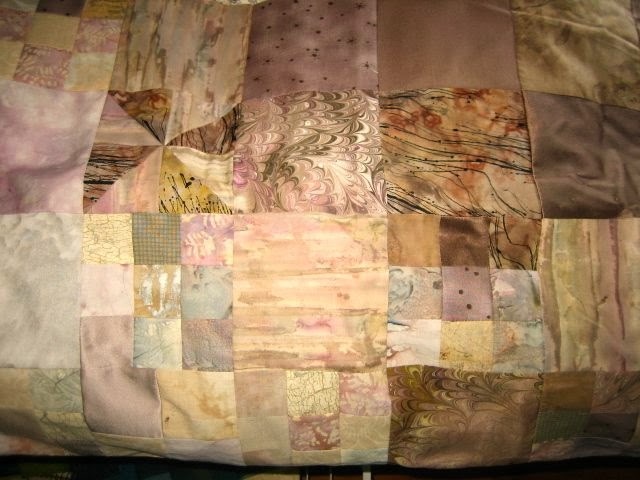 And this one from 2 years ago retreat almost ready to quilt. I get very impatient when I am surrounded by all these wonderful projects so close to being finished and I can't do a thing about it. I know...patience should be on my New Years Resolution List. Anyway, Happy New Year everyone, thanks for hanging in there with me and as always wishing you a wonderfully creative and healthy 2014.